This week's theme is Clan Lore! Select up to three (3) dragons from your lair and tell us a little bit about them and your clan's lore! Click here for this week's discussion thread and the A Dragon's Best Friend spotlight! marth, the founder! he created the clan to find his own identity in a place where he had none. the clan has a lot of separate stories happening within it, but marth is the one who oversees the clan and ties it all together by his presence alone. he hopes that his clan achieves its purpose of guiding the dragons who come across it to whatever their fates may be - be it inside the clan, or elsewhere. blake, the first member! she joined the clan after marth and caeda founded it, and now holds the position of the leader of the glass order, the clan's mages - she also is a member of the gilded circle, the council that determines the course of the clan as a whole. and robin, the cursed one! she is a member of the glass order, and like its leader, a member of the gilded circle, being one of the first dragons to join the clan. she was once well-respected for her magical prowess and the joy she found in teaching others, but things... changed. she seems to have been a first sign of stranger and darker things happening in the clan, though her current state was nothing more than the result of a self-proclaimed shaman's whims. yet none of the clan's members have figured out how to undo the curse that keeps her in her constant state of madness, and it now appears that the responsibility to break it has fallen to robin's three beloved daughters: the twin sisters khatorl and soltnar, and their younger adopted sister, morgan. the three work hard, especially the more magically-inclined two, but hope is still the only thing they cling onto. 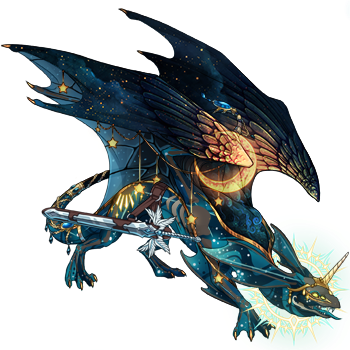 [center][url=http://flightrising.com/main.php?dragon=35219450] [img]http://flightrising.com/rendern/350/352195/35219450_350.png[/img] [/url] This is my clan leader (and progen) Moonlord. He's very old, from almost the dawn of dragonkind, and has lived for generations. He's seen a lot. He's not a great guy, but getting lost in the Abiding Boneyard for a few decades will do that to you, even more so when you get possessed by evil spirits along the way. He rules his clan with an iron grip, mostly due to being the largest dragon in the clan, and having the full undying loyalty of several of his powerful sons. [s]He denies all accusations of clanmate murder. 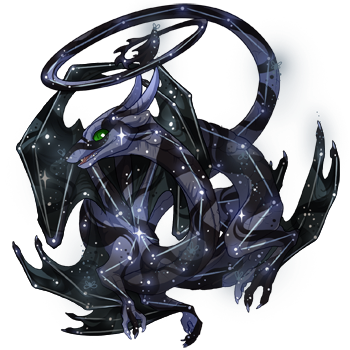 [/s] [url=http://flightrising.com/main.php?dragon=35668914] [img]http://flightrising.com/rendern/350/356690/35668914_350.png[/img] [/url] This is Arcaestain. Not only is he a prophet but he's a crazily powerful one, and (although he denies it) a mind reader. Him and his close kin are some of the strongest mages around. 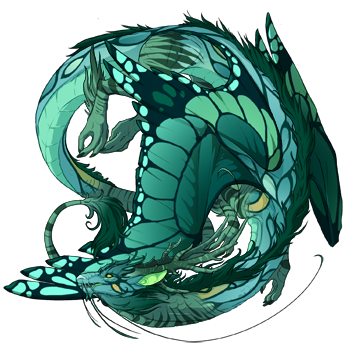 His childhood friend [url=http://flightrising.com/main.php?dragon=35670728]Vipersprite[/url] happens to be out to kill him, which means he often disappears unless he needs to be present to give omens to the clan. He's the only one in the clan that seems to realize it was created as a prison, as it doesn't seem entirely inside this reality... Recently his prophesies have been all about death, destruction, and war-- which sounds rather pleasant compared to normal clan life, actually. [url=http://flightrising.com/main.php?dragon=35091728] [img]http://flightrising.com/rendern/350/350918/35091728_350.png[/img] [/url] This is Tesona. She's an archivist first, mage second, and rival to the clan leader. 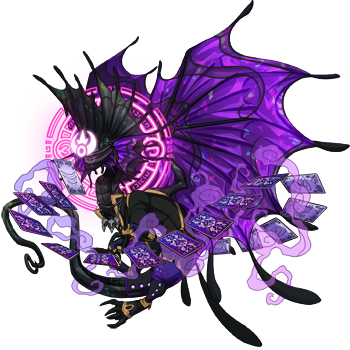 She and her [url=http://flightrising.com/main.php?dragon=35240500]mate[/url] run and maintain the clan's library, protecting books that Moonlord would want destroyed, and teaching their clanmates to read. She is one of the lowest-ranking members of the clan, but she actually holds more political power than most of the clan put together. 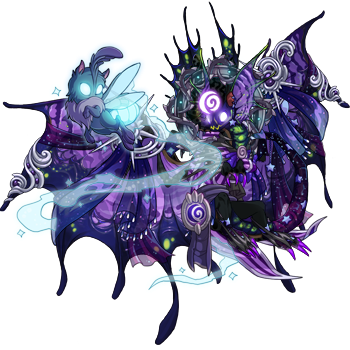 While of no note herself, she has friends in [url=http://flightrising.com/main.php?dragon=45796544]House Gardisto[/url], a powerful and scholarly Great House from the birth of dragonkind. More than enough backup to crush the clan's guard should she ever feel the need. This is my clan leader (and progen) Moonlord. He's very old, from almost the dawn of dragonkind, and has lived for generations. He's seen a lot. He's not a great guy, but getting lost in the Abiding Boneyard for a few decades will do that to you, even more so when you get possessed by evil spirits along the way. He rules his clan with an iron grip, mostly due to being the largest dragon in the clan, and having the full undying loyalty of several of his powerful sons. He denies all accusations of clanmate murder. Recently his prophesies have been all about death, destruction, and war-- which sounds rather pleasant compared to normal clan life, actually. This is Tesona. She's an archivist first, mage second, and rival to the clan leader. She and her mate run and maintain the clan's library, protecting books that Moonlord would want destroyed, and teaching their clanmates to read. She is one of the lowest-ranking members of the clan, but she actually holds more political power than most of the clan put together. While of no note herself, she has friends in House Gardisto, a powerful and scholarly Great House from the birth of dragonkind. More than enough backup to crush the clan's guard should she ever feel the need. These two guys are the important characters in my lore. 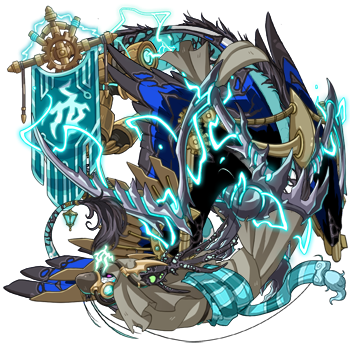 Yohn (the guardian) is my progen, and he started an outcast clan on the edge of the Lightning and Light border. Legacy (the imp) traveled across the continent and ended up in Yohn’s clan briefly before continuing on to the Hewn City. He used his inherent magic as a direct descendant of two of the Lightweaver’s first imperials (Demelin and Sylva) to reconstruct and resurrect the Hewn City, dragging it out of the shadow and back into the light. For further info on all of these dragons, they have individual lore for further reading. It's a bit outdated though. Nowhere Asylum is a group of dragons outcast from larger society. They have formed a sanctuary for those who don't fit, those who have or likely would have been banished, dragons who wanted to escape fate, and many more. Everyone has a reason to stay at the camp, and anyone can at the discretion of the inmates. We uphold freedom above all else. Many believe anarchy can only fail, but the survivors of the years under the thumb of a cruel and controlling Mirror are evidence to the contrary. Things are surprisingly peaceful. We are travelers. While the camp is permanent, the ground beneath it is not. In fact, the ground is a massive creature made of organic parts held together and kept alive by potent Plague magic. This beast carries us upon its back, guided by a young Skydancer who's formed a strong bond with it. We follow the festivals, making journeys to the greatest concentrations of elemental celebrations, creating a regular travel schedule that has been followed for many years. We keep our camp open to other travelers. Anyone can stop by for room and board when space is available, and take advantage of the services some of us have decided to offer. [url=http://flightrising.com/main.php?dragon=6898795] [img]http://flightrising.com/rendern/350/68988/6898795_350.png[/img] [/url] Kvatyr is one of our primary founders. Things began when a few dragons interested in seeing the world found themselves in the Wasteland. They learned that none of them fit in where they came from, which helped motivate their traveling. They stuck together on a journey from the Boneyard to Rotrock Rim and found that they got along well. They decided to stick together for the foreseeable future. These are the primary founders. As more joined their little group of wanderers, the primary founders declared the growing group to be a clan. Kvatyr was the unofficial leader and led them into new regions of the world. At this time, the camp was always temporary. The dragons had to carry everything they owned when it came time to move on. One day, a Mirror named Vinten joined them, along with a Pearlcatcher and Fae. Vinten was much more of a threat than first expected. He manipulated them all, especially Kvatyr and took over. Even before he showed up, things weren't always easy and during a food scarcity, Kvatyr secretly went to hunt lost and weak dragons in the area to conserve what little food was left. Little did she know this would become her greatest temptation. When Vinten found out, he'd already gotten everyone on his side, or at least it seemed that way. Kvatyr was locked away and starved, but a few did continue to give her sympathy in secret, even after figuring out what she'd done. With Kvatyr out of the way Vinten forced everyone into submission by almost any means necessary. With Kvatyr out of the way, they stopped traveling and set up in the Wandering Contagion. His reign of terror lasted for many years, and the day he was murdered is a day still celebrated. Kvatyr was freed and stepped down from any leadership she once had, giving it to everyone else who'd just been liberated. Traveling resumed with the construction of the beast who carries us. Since then, she's been enjoying a quiet retirement and still advises on issues when asked. One of the inmates who came along after they'd been freed grew oddly attached and loyal to her and helps her move as during her imprisonment, her movement was so restricted that her limbs had atrophied. Luckily, she is still a proficient flyer. She still has quite the taste for dragon, and now relies on bounties to feed herself with the help of Xolotl, her personal body guard and living wheel chair. [url=http://flightrising.com/main.php?dragon=10654770] [img]http://flightrising.com/rendern/350/106548/10654770_350.png[/img] [/url] While not present since the beginning, Dr. Krova is an important figure and crucial to the sanctuary's continued existence. His parents were a couple of the primary founders and he hatched a few years into the clan's existence. From the beginning, things were odd. No one knows what causes his instability. Some think he's cursed, others say he's been infected by the Shade. Regardless, when Vinten met him as a young dragon, Krova became one of his greatest targets. Since then, Krova did not know peace and as a move to try and protect him from Vinten, his mother "appointed" him as the clan doctor. This was surprisingly effective and Krova eagerly took to the idea, showing a natural proficiency and fascination with biology. Of course, his journey was hindered by Vinten and fought him for the ability to actually work as a medical doctor. Vinten eventually let him work, but otherwise wouldn't let up on the control he held over him. Eventually, Krova had enough and worked up the courage to strike back, ambushing Vinten and ending his reign. 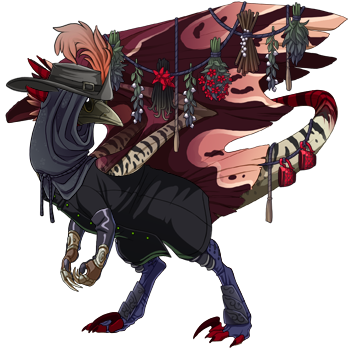 Since then, Krova has been generally much happier and proved to be a very knowledgeable and skilled surgeon despite his unknown condition necessitating support and supervision by a lifelong buddy of his... [url=http://flightrising.com/main.php?dragon=8309596] [img]http://flightrising.com/rendern/350/83096/8309596_350.png[/img] [/url] Mortos is another primary founder, coming from the Tangled Wood. At first, he was a powerful Shadow mage and guarded the others, as he was the only one good with magic. He would go on to teach Kvatyr the basics of all elemental magic, giving her a foundation to hone her Plague magic. When Krova hatched, there were much more dragons around, allowing him to help look after him as needed. During Vinten's rule, Mortos wasn't much of a direct target. His involvement was with defending Krova. Coming out of that era, Mortos retired from being a mage and resigned himself to his interest in ghosts and dedicating himself to being Krova's personal caretaker, having known him all his life and forming an unbreakable bond and extreme level of trust. For further info on all of these dragons, they have individual lore for further reading. It's a bit outdated though. Nowhere Asylum is a group of dragons outcast from larger society. They have formed a sanctuary for those who don't fit, those who have or likely would have been banished, dragons who wanted to escape fate, and many more. Everyone has a reason to stay at the camp, and anyone can at the discretion of the inmates. We uphold freedom above all else. Many believe anarchy can only fail, but the survivors of the years under the thumb of a cruel and controlling Mirror are evidence to the contrary. Things are surprisingly peaceful. We are travelers. While the camp is permanent, the ground beneath it is not. In fact, the ground is a massive creature made of organic parts held together and kept alive by potent Plague magic. This beast carries us upon its back, guided by a young Skydancer who's formed a strong bond with it. We follow the festivals, making journeys to the greatest concentrations of elemental celebrations, creating a regular travel schedule that has been followed for many years. We keep our camp open to other travelers. Anyone can stop by for room and board when space is available, and take advantage of the services some of us have decided to offer. Kvatyr is one of our primary founders. Things began when a few dragons interested in seeing the world found themselves in the Wasteland. They learned that none of them fit in where they came from, which helped motivate their traveling. They stuck together on a journey from the Boneyard to Rotrock Rim and found that they got along well. They decided to stick together for the foreseeable future. These are the primary founders. As more joined their little group of wanderers, the primary founders declared the growing group to be a clan. Kvatyr was the unofficial leader and led them into new regions of the world. At this time, the camp was always temporary. The dragons had to carry everything they owned when it came time to move on. One day, a Mirror named Vinten joined them, along with a Pearlcatcher and Fae. Vinten was much more of a threat than first expected. He manipulated them all, especially Kvatyr and took over. Even before he showed up, things weren't always easy and during a food scarcity, Kvatyr secretly went to hunt lost and weak dragons in the area to conserve what little food was left. Little did she know this would become her greatest temptation. When Vinten found out, he'd already gotten everyone on his side, or at least it seemed that way. Kvatyr was locked away and starved, but a few did continue to give her sympathy in secret, even after figuring out what she'd done. With Kvatyr out of the way Vinten forced everyone into submission by almost any means necessary. With Kvatyr out of the way, they stopped traveling and set up in the Wandering Contagion. His reign of terror lasted for many years, and the day he was murdered is a day still celebrated. Kvatyr was freed and stepped down from any leadership she once had, giving it to everyone else who'd just been liberated. Traveling resumed with the construction of the beast who carries us. Since then, she's been enjoying a quiet retirement and still advises on issues when asked. One of the inmates who came along after they'd been freed grew oddly attached and loyal to her and helps her move as during her imprisonment, her movement was so restricted that her limbs had atrophied. Luckily, she is still a proficient flyer. She still has quite the taste for dragon, and now relies on bounties to feed herself with the help of Xolotl, her personal body guard and living wheel chair. While not present since the beginning, Dr. Krova is an important figure and crucial to the sanctuary's continued existence. His parents were a couple of the primary founders and he hatched a few years into the clan's existence. From the beginning, things were odd. No one knows what causes his instability. Some think he's cursed, others say he's been infected by the Shade. Regardless, when Vinten met him as a young dragon, Krova became one of his greatest targets. Since then, Krova did not know peace and as a move to try and protect him from Vinten, his mother "appointed" him as the clan doctor. This was surprisingly effective and Krova eagerly took to the idea, showing a natural proficiency and fascination with biology. Of course, his journey was hindered by Vinten and fought him for the ability to actually work as a medical doctor. Vinten eventually let him work, but otherwise wouldn't let up on the control he held over him. Eventually, Krova had enough and worked up the courage to strike back, ambushing Vinten and ending his reign. Mortos is another primary founder, coming from the Tangled Wood. At first, he was a powerful Shadow mage and guarded the others, as he was the only one good with magic. He would go on to teach Kvatyr the basics of all elemental magic, giving her a foundation to hone her Plague magic. When Krova hatched, there were much more dragons around, allowing him to help look after him as needed. During Vinten's rule, Mortos wasn't much of a direct target. His involvement was with defending Krova. Coming out of that era, Mortos retired from being a mage and resigned himself to his interest in ghosts and dedicating himself to being Krova's personal caretaker, having known him all his life and forming an unbreakable bond and extreme level of trust. Crowdragon was the founder of the clan, happening upon a small cave as a fae. Eventually she morphed into a noc from reading so many scrolls in the dark. Soon more abandoned dragons happened upon her cave and joined, eventually forming a clan. After a year of ruling over the clan she shifted her leadership to a young Skydancer, Crow, whom turned a new leaf after falling into the cave and hurting her wings, and was nursed back to health by Crowdragon as if being a daughter of her own. Now Crow want's to turn her own new leaf and raise Constellation, a abandoned spiral to soon become the new leader for the clan, after the spiral was dropped off at midnight by one of the couriers, whom said "Found this little guy up for sale for cheap, so I thought I could bring her along till I found the right clan for her." and left, leaving the small Spiral behind, when Crow took her under her wing. Leon Sleetspine - the Founder. At the base of the Fortress of Ends, the jagged ice mountains hide inumerable secrets and horrors locked away in frozen solitude. It was there that a tiny warrior fae discovered the remains of a yawning chasm clawed into the mountains nearly an era ago. The hollow remains of a great bastion, a crumbled castle made of ice lay before him in disarray. It’s inner halls were mostly intact, leading down, down, down into a vast network of empty pits. In each were signs of horrors long escaped into the cold wilds, of chains snapped, and walls raked by angry claws. Only one dismal cell remained unopened, rows upon rows of steel sewn together by thick layers of ice frozen over through the ages held it shut. But the fae’s keen ears could still hear the low, steady breathing of something awful in the cell. Something with the patience to swallow worlds and dwell in darkness eternal. And the warrior knew his purpose then. This thing could not escape as the others had. And he’d make sure of that. This warrior, named Leon Sleetspine, claimed the ruins as his own, and set out amidst the ice to find others to help him rebuild the vast halls, and populate it was warriors, mages and guards to serve the Ice Warden’s creed. ♠ Adan - the Dark Ranger. ♠ Sinbauldr - the Knight in Exile. ♠ Adderblaize & Adderbreize - the Expeditious Siblings. ♠ Imith - the Shadow Paladin. ♠ Indocarpe - the Constellation Sorceress. ♠ Thistlebark - the Enigma. ♠ Diablos - The Dread-Folly Dragon. this is Milkshake! 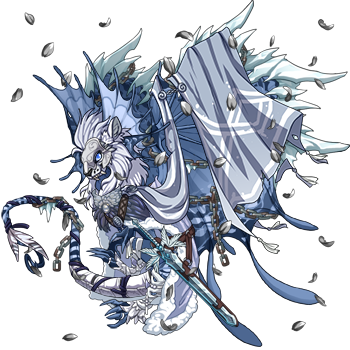 he was found by one of my other dragons, Faerieth as she was on patrol and brought him into the lair. no one could find his parents, and he split milkshake over himself as he was being looked after by some of the other dragons and that's how he got his name. chaos is my name, chaotic stupid is my game!